Potholes are a menace; that’s something pretty much all motorists around the world can agree on. At best, they jolt what may be an otherwise comfortable and refined ride quality. At worst, they burst our car tyres and cause potentially life-threatening accidents. New figures from the RAC show that they became more problematic in the last three months of 2017, with the company’s patrol teams attending 11 per more breakdown that were caused by potholes. Between October and December, the RAC service recorded 2,830 individual member incidents where the vehicle had broken down due to damaged shock absorbers, broken suspension springs or distorted wheels, likely caused by poor quality road surfaces. This is 283 more than the 2,547 similar incidents noted in the final quarter of 2016 and it suggests the surface quality of some UK roads has already been impacted by the higher rainfall and increased days of frost at the end of 2017. Consequently, a lot rests on what remains of winter, with further frost and snowfall likely to lead to further road surface deterioration . For the year on a whole, the total number of RAC ‘pothole’ faults recorded in each quarter of 2017 exceeded the equivalent quarters in 2016. 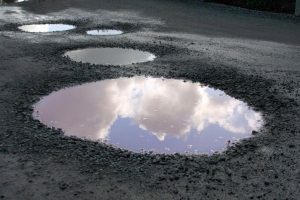 RAC chief engineer David Bizley believes most drivers will be concerned by the supposed rise in potholes. “After several years in which the surface quality of our roads appeared to be improving, our analysis suggests that for the third successive quarter, we have gone backwards,” he commented.